At the Annual Function of Women’s only literary organization dedicated exclusively to literary development of women: Gyan Gangotri Kavya Manch felicitated 4 martyr families. Film actor Sunil Shetty, Neil Nitin Mukesh and Mangal Prabhat Lodha felicitated families of Operation Rakshak martyr Basvaraj; Operation Parakram Martyr Ramesh Kandappa Patil and martyred in 2010 Bhutali’s family was awarded and felicitated by the organization on this occasion, Founder, Mrs. Manju Lodha also launched her book of poems dedicated to the soldiers and their families’ names: …Ki … Ghar Kab Aaoge. 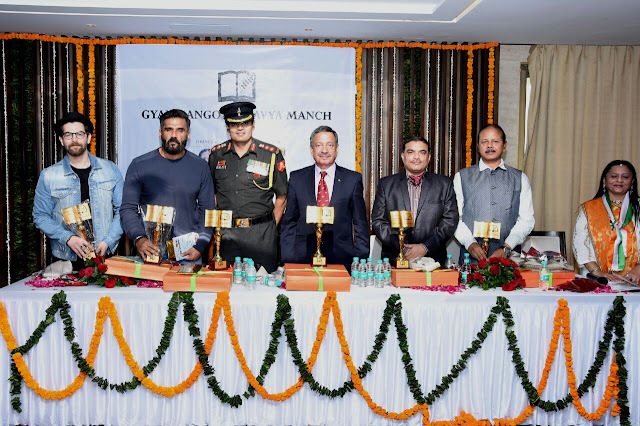 The event held at Lodha Costeira actors Neil Nitin Mukesh and Suniel Shetty expressed their feelings towards the soldiers and their families' and also appreciated the work done by Gyan Gangotri. Within a very short span of starting this Gyan Gangotri by Mrs. Manju Lodha and Ms. Bina Ladha, this institution has provided platform to more than 125 domestic and family women who have writing and poetic genius. Senior BJP MLA Mangal Prabhat Lodha held a distinct hospitality to Air Marshal Bhushan Gokhale and honoured the brave soldiers and martyr families. Wing Commander MA Afroz, commander Paresh Kohli and Commander Kaushik were also present as special Guest. Abhinandan Lodha and his family too were present in the program to meet the martyr families. His little girl Yashvi Lodha won applause for her poem telling on the heroic warriors Little Avir Lodha had disguised as Netaji Subhash Chandra Bose and won everyone's heart when he came on stage with his cute attitude. More than 200 people associated with many social, literary and educational institutions in Mumbai were present in the program.